Successfully Added 1080P HD Camcorder (Pre-Record, Motion Detect, Full HD, More) to your Shopping Cart. Introducing the newest 1080P HD Camcorder that perfectly combines style, performance, and affordability. Featuring an attractive slimline body, full high-definition 1080P video recording, direct YouTube/Facebook uploading, and all the features you expect from a top-of-the-line Full HD Digital Camcorders, the DV43 does it all. This 1080P HD Camcorder (Pre-Record, Motion Detect, Full HD, More) captures video in 1920 x 1080 resolution (1080P Full HD) at 30 FPS as well as pictures up to 16MP (4608x3456 - 16 megapixels), which means "simply amazing" in less technical terms. This camcorder not only creates crystal clear and vibrant pictures and video, but does it in a large resolution that will look more than glorious on a plasma or LCD large screen TV. Capture live sporting events, the little one's unforgettable first times, and everything in between with this first class camcorder. The 1080P HD Camcorder (Pre-Record, Motion Detect, Full HD, More) includes many features specifically made to support everyday use, including image stabilization for those with shaky hands, motion detection recording, and a smooth slow motion recording used to capture individual rain drops or subtle facial expressions. Also included is the convenient pre-record function, which records video for a full three seconds before you even press a button - an important feature that will ensure capturing of those random and spontaneous moments nobody (but this 1080P HD Camcorder) sees coming. Once users have captured the perfect video or photo, they can upload it directly to YouTube or Facebook using the advanced Internet Direct feature. All it takes is a few seconds, and a few clicks, to upload and share those funny and unforgettable moments with others. Taking pictures and video on the (model number) 1080P HD Camcorder (Pre-Record, Motion Detect, Full HD, More) is just as easy and convenient, especially with the intuitive menu system and controls. Boasting more than just amazing specifications and functionality, the beautiful outer design of this full HD camcorder is a whole world of its own. 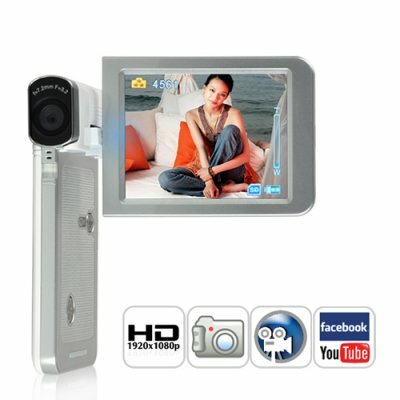 With its unique clamshell style and super-slim 17mm thick body, this 1080P HD Camcorder is designed for easy portability and everyday use - all while being able to show off the sleek and exquisite appearance. Also included is a convenient fold-out 3.0 inch LCD swivel screen that allows users to playback captured photos and videos, as well as a AV output and HDMI slot for those who need more. Featuring amazing performance and a beautiful design, the DV43 1080P HD Camcorder is easy enough for the whole family to use and powerful enough to satisfy independent video producers and enthusiasts. Available in our warehouse now, order today and we'll ship it out tomorrow! Brought to you by the leader in China Electronics - Chinavasion. Upload video and photos directly to YouTube or Facebook! How does this camcorder compare to Sony camcorders and Sanyo camcorders? The DV43 is more powerful, thinner, and sexier. It also comes at a low China wholesale price! If the LCD preview is not clear while shooting, how can the focus be adjusted? Try to switch between Macro and Normal Mode. It is next to the camera lens. The files on the memory card do not display and shows a "!" mark, why? Either the SD card is low speed or has the wrong content inside. The way to solve this is to format the SD card through the camera instead of a PC. Please check the user manual for instructions on how to format. Keep the camera (and the target subject) steady for several seconds when taking pictures. You can also try setting the ISO to 1600 or using the normal and digital light for brightness. How slow is the slow motion recording? How many pictures/sec? on 2010-05-12 21:12:26 Great Value for such camera! on 2010-05-07 19:08:33 I am delighted with the camera!!!!! I am delighted with the camera!!!!! This is a product of the year! It is very suitable for filming my little daughter!